CXO or Chief Experience Officer is the top executive in the organization who is responsible for ensuring positive experience or interaction between the brand and the external customer base. The external customers are the ones who buy your product, wholesalers or service agencies. The CXO’s have gained popularity in almost every industry since their job plays a vital role in business success. This title started replacing Chief Customer Officer (CCO) in retail and entertainment industries whereas Chief Activity Officer (CAO) in healthcare and travel segment recently. This development is said to continue since customers are often getting disconnected from the company because of a miserable experience. If you want to target the CXO’s of several companies who are responsible for providing excellent customer experience, we are here to help you. Blue Mail Media offers the best CXO Mailing List that comes with more than 90% deliverability rate. Also, the list is designed to stay compliant with GDPR and Anti-Spam law. Hence you can use our database to target a large number of executives from several countries with no fear. 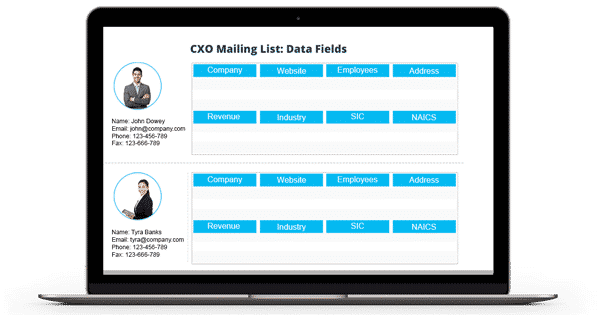 Blue Mail Media’s Chief Experience Officer Mailing List lets you meet your target CXO’s and thereby helps you in the successful execution of multi-channel marketing campaigns. You can have seamless interaction with them regardless of boundary constraints. That is, you can reach CXO’s residing or working in various parts of the world such as USA, UK, Europe, Russia, Africa, North America, South America, Asia, and others. Since our database is GDPR compliant, you do not have to worry about data legitimacy. We take care of it! Our team makes verification calls and sends verification emails on a regular basis to provide you with the highly accurate and reliable Chief Experience Officer Email Database. They update the list once in every 90 days to keep it fresh and clean. Hence you can trust the preciseness of our data with no dreads. The data they gather for CXO List is from various authentic and internationally trusted sources such as yellow pages, business directories, surveys, conferences, government records, and more. It proves the rightfulness of our database. Buy our email list and increase your company revenue efficiently. You can either dial 1-888-494-0588 or send an email to sales@bluemailmedia.com for more details! Our team of data scientists, analysts, and experts constantly dig out the most qualitative data to power your multi-channel marketing strategies. Also, we ensure that our List of CXO Email Addresses remains accurate and updated by making thousands of verification calls each day and sending out verification emails.